However, the idea of unicorns in the Bible really surprises me! Was this a mistranslation in the original King James version? Or does "unicorn" seem to be a valid translation for this word? David Boswell is absolutely correct - animal names are consistently difficult to translate. ...It is difficult to say what kind of beast is intended by the original word. The Septuagint translate the word μονοκερως, the unicorn, or one-horned animal; the Vulgate, sometimes, unicornus; and in the text rhinocerotis, by which the rhinoceros, a creature which has its name from the horn on its nose, is supposed to be meant...The creature referred to is either the rhinoceros, some varieties of which have two horns on the nose, or the wild bull, urus, or buffalo; though some think the beast intended is a species of goat; but the rhinoceros seems the most likely. There is literally a monoceros, or unicorn, with one large curled ivory horn growing horizontally out of his snout; but this is not a land animal, it is the modiodan or nurwal, a marine animal of the whale kind, a horn of which is now before me, measuring seven feet four inches; but I believe the rhinoceros is that intended by the sacred writers. This book deals extensively with the word reim (spelled as re'em), the question of unicorns and many other difficult to translate animals in the Bible (some relevant content is available to read as a free preview on google books). The allusions to the "re'em" as a wild, untamable animal of great strength and agility, with mighty horns (Job xxxix. 9-12; Ps. xxii. 21, xxix. 6; Num. xxiii. 22, xxiv. 8; Deut. xxxiii. 17; comp. Ps. xcii. 11), best fit the aurochs (Bos primigenius). This view is supported by the Assyrian "rimu," which is often used as a metaphor of strength, and is depicted as a powerful, fierce, wild, or mountain bull with large horns. The decisive factor came with the deciphering of the cuneiform inscriptions... reaching back four thousand years earlier than any Hebrew text that we have, [the texts] give the word rimu repeatedly... It is a gigantic wild ox. The cuneiform ideogram confines him to the mountains. The unicorn mistranslation derives from the Septuagint. 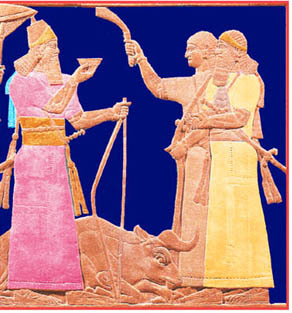 The aurochs, it seems, was typically depicted in Assyrian art from a profile view with gives it the appearance of having one horn. (This image may show the animal in question.) Perhaps lacking a specific word for the aurochs, but being aware of what it looked like, the translators described in as the monkeros ("one-horned") because of the one horn. (The animals was likely locally extinct by then; it went extinct globally in the 16th century.) As Greeks learned of the rhinoceros this word adopted to describe it (or maybe the word was first used for the rhino and adapted to translate re'em since both animals essential feature was having one horn), and eventually changed to rhinokeros. A number of first millennium commentaries on passages that contain the word re'em are extant. In general, the animal is equated with the rhino, but in a few cases it is compared to a bull, or seen as symbolic of power. The mythical unicorn doesn't enter into the picture until the middle ages. The aurochs theory is generally accepted as accurate today, which is why many modern translations use "wild ox" - a rough English description of the creature. (Incidentally, it is thought that this is the animal depicted in the Lascaux cave paintings.) "Rhinoceros" is not an entirely impossible translation, but considerably less likely. 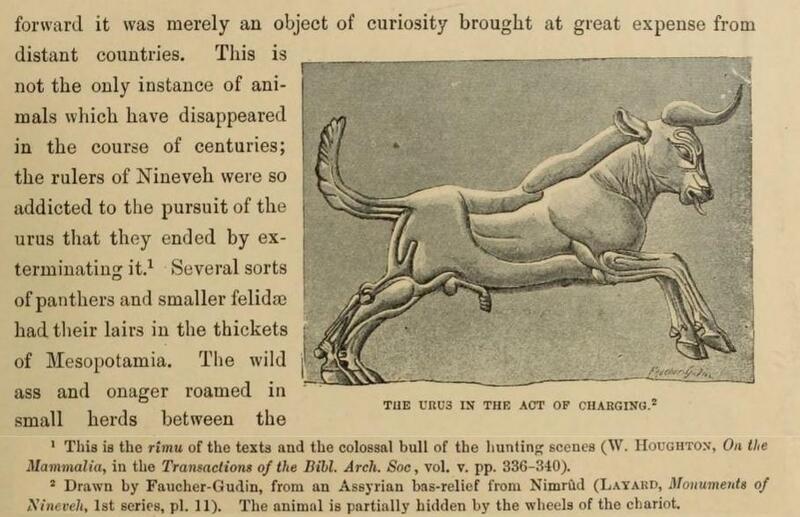 A more recent/popular account of much of this material (plus the rise of the unicorn myth) can be found in The Natural History of Unicorns by Chris Lavers. I am not really giving an answer here, but rather a clue that may help in finding the answer. I looked at the LXX (that includes English translation) for Psalms 22:21 and have noticed that, it too, uses the term "unicorn". The Greek word that is used in the LXX (Ps 21:21) is monokeros (μονόκερως). Using a Greek-English dictionary I learned that monokeros translates to "unicorn". Regarding "Was this a mis-translation in the original King James version? Or does "unicorn" seem to be a valid translation for this word?" - It appears as though the KJV translated from the LXX and, if so, then the translation would be valid. I think the question begs whether or not the LXX has used monokeros properly in its translation. "Save me from the lion's mouth; yea, from the horns of the רמים[plural version; pronounced "reymim"]." God brought them out of Egypt, He has as though the lofty horns [תועפֹת] of a רְאַם [singular, pronounced "re'em"]. His firstborn ox, grandeur is his, and his horns are like the horns [קַרְנֵי] of a רְאַם; with them he shall push the people together to the ends of the earth; and they are the ten thousands of Ephraim, and they are the thousands of Menasheh (Deuteronomy 33:17). Even with this verse, Radak continued to hold that a רְאַם had just one horn, but his view was rebutted by Rabbi Eliyahu Ashkenazi, in his response to Radak, who said that the animal does have two horns and is therefore not a unicorn. The above analysis, by Rabbi Nathan Slifkin, one of the most prominent authors on Biblical references to exotic animals, in an article titled "Exotic Shofars: Halachic Considerations," goes on to determine that the ראם is a type of cow, citing additional Biblical verses and Talmudic authority. Unicorn is a correct translation. Noah Webster's 1828 dictionary says that a unicorn is a rhinoceros, and a rhinoceros is a unicorn. The Latin Vulgate says "rinocerotis" in Deut 33:17 and "rinoceros" in Job 39:9. The King James says "Or Rhinocerots" in the marginal note in Isaiah 34:7. Even scientists today use the word unicorn in reference to the one-horned rhinoceros, which has the scientific name "Rhinoceros unicornis." But Deut. 33:17 is actually a two-horned rhinoceros (bicornis), so the KJV translated that verse wrong. But Psalm 92:10 is talking about a one-horned rhinoceros, so that verse is translated correctly. Regardless if this is a "Rhinoceros" or not, the people by and for whom it was originally written knew exactly what the animal was, and for them it was not fiction or mythology, but a REAL flesh and blood animal. Or "unicorn" simply means "Rhinoceros" or some other animal, as many have suggested. Either way, whatever a "unicorn" was / is, either IT, or the animal the ancient name refers to, definitely existed at the time that the verses that refer to them were written. Of course, I do acknowledge that at present times, it lends ammunition for mockers, and just because of that I wouldn't be altogether surprised to someday find out that God left a few REAL literal "unicorns" around in some remote wilderness just to make the mockers eat some more crow. Particularly since the very same silly vain people would have mocked you to scorn if you told them - in all their worldly "scientific" ignorance, and with equal vitriol, about Gorillas as recently as a hundred years ago. Not the answer you're looking for? Browse other questions tagged hebrew psalms translation-philosophy kjv plants-and-animals or ask your own question. What translation philosophies have caused such a wide variation in the translation of *tachash* skins? How did Biblical translators decide on cypress for the type of wood in Noah's ark? Why do translations use “wild ox”? Why distinguish the genders of asses/donkeys in Gen 12:16? In Matthew 21:16, did Jesus misquote Psalms 8:2 by saying “praise” instead of “strength”? What is the meaning of the Hebrew words “temunah” and “adameh” as translated in the KJV, particularly in Numbers 12:8?